The response to my previous post on Intel's "slave ship" advertising showed me just how split Americans are about race. More than 30,000 sent faxes to Intel's board of directors complaining about Intel's insensitivity and its political agenda taking aim at civil rights class action cases. Hundreds of others emailed me to complain that I was seeing racism when there was none. 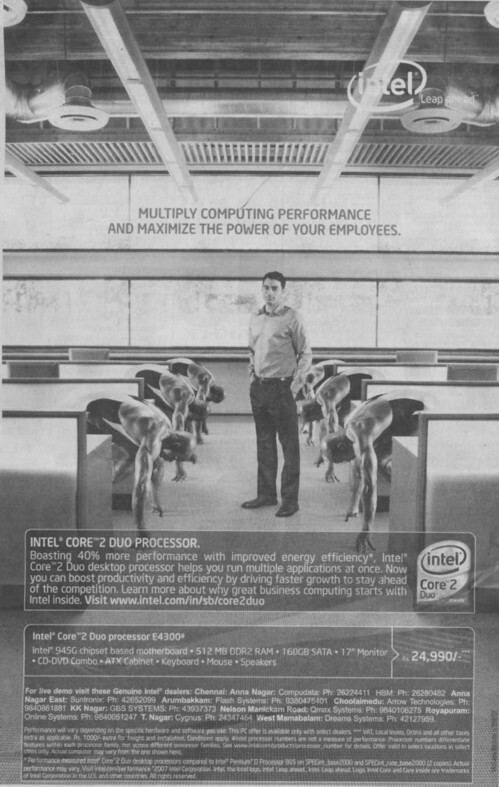 If you have one of those folks in your life, point out Intel's version of the "slave ship" ad in India. If race didn't matter to Intel in creating the ad, why did the company subsitute the light skinned Indian boss for the white, chino-wearing boss? If the Intel ad execs cared enough to do that, they obviously knew the implication of having five African American men on their knees. What would people on the street see in the Intel ad? A new YouTube video answers that question. Will Intel pull back on its attempts to kill civil rights class action cases in California? No sign of that yet, other than Intel's thin skin is showing on its google banner ad advertising. My consumer group bought a google sponsored ad for Intel searches to point out Intel's "slave ship" agenda. The ad went to the top of the google search, until the next day when Intel must have outbid us and got the top spot.